The comedy so well suspended her care that no one, observing her during the first four acts, would have supposed she had any wretchedness about her. On the beginning of the fifth, however, the sudden view of Mr Henry Tilney and his father, joining a party in the opposite box, recalled her to anxiety and distress. The stage could no longer excite genuine merriment — no longer keep her whole attention. Every other look upon an average was directed towards the opposite box; and, for the space of two entire scenes, did she thus watch Henry Tilney, without being once able to catch his eye. No longer could he be suspected of indifference for a play; his notice was never withdrawn from the stage during two whole scenes. At length, however, he did look towards her, and he bowed — but such a bow! No smile, no continued observance attended it; his eyes were immediately returned to their former direction. The side boxes at the lower level each side of the Theatre had seats (the upper two levels were standing galleries), and Austen scholars are generally of the opinion that this scene takes place in them, probably because Miss Austen’s actual situation in society would most likely place her attendance there. 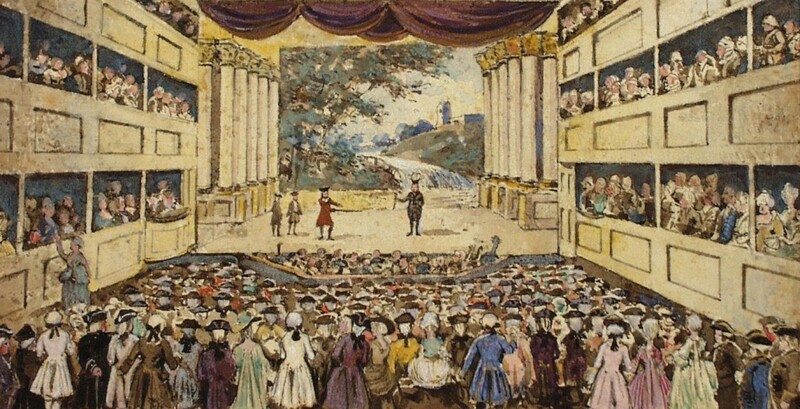 However, at the time the book was written, the Theatre also had grand boxes at the upper rear, arranged in a semi-circle with the two extreme boxes also facing each other. The social (and financial) status of the fictitious Allens and Tilneys would have made these boxes more likely of their patronage.